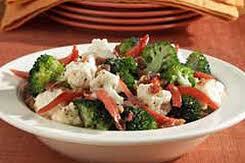 Break the broccoli amd cauliflower into small pieces and combine in a large bowl. Add the raisins, red onion, bacon and cashews. Mix dressing ingredients together and pour dressing over salad. Serve.